Sue Groth, MnDOT traffic safety and technology director. There is nothing like an impending lane closure to bring out the worst in drivers. Should I speed up? Will they slow down? These are just a few of the questions we ask ourselves as the fuzzy dice dangling from our rear view mirror taunts us; a painful reminder of the game of chance our roadway experience has become. Merging, however, does not necessarily entail throwing caution to the wind. In fact, I would highly discourage it. As with most social quandaries we encounter, there is a clear step forward when we understand the social etiquette. 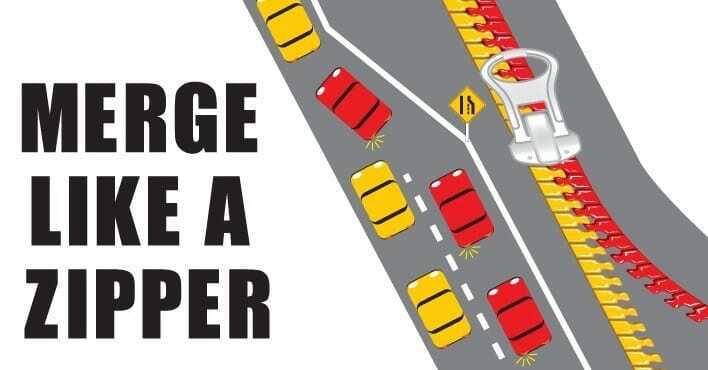 Enter The Zipper Merge: the answer to all (well, many) of our merging needs. How does one properly merge like a zipper? Follow the advice from our Canadian neighbors from the Ministry of Transportation and Infrastructure Online. Step 1: Accelerate to match the speed of highway traffic as you travel on ramp. Step 2: Be aware of your surroundings by checking mirrors and blind spots. Step 3: Flick your blinker signal on to let other drivers know you plan to shift lanes. Step 4: Speed up or slow down slightly if a vehicle is right beside you, positioning your vehicle to enter an open space. Step 5: Merge gradually into the neighbouring lane by following the path of the merging ramp. Bonus Step (optional): Give a friendly “thank you” wave to the driver who gave you space to help you merge safely.